Four workers were charred to death and 17 injured, eight of them seriously, in a blast at Dasmesh Medicare Private Limited, a pharmaceutical company, at Basouli village near here this morning. 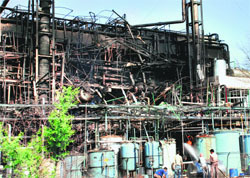 The Dasmesh Medicare Private Limited unit after the accident. Ignorant about issues tabled in the Municipal Corporation General House meeting, councillors seems to rush to conclusions to reject items without going through the contents of an agenda. Accusing IAS officer Prerna Puri of misusing her official position in an alleged case of mistreating a 13-year-old domestic help hired by her mother, the non-government organisation Vatsal Chhaya today moved the Punjab and Haryana High Court. 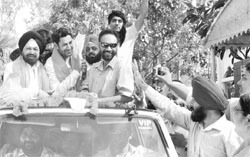 Prominent singer and recently appointed Chairman of the Mohali District Planning Committee, Harbhajan Mann, said here today that a special agenda for the development for the district would be drawn up soon. Councillors today expressed resentment against mismanagement in calling committee meetings by municipal corporation officials. Thirteen persons, including two children, were injured as the tempo they were travelling in overturned near the Badheri roundabout in Sector 40 here this morning. (Clockwise) The vehicle that met with an accident at Sector 40 in Chandigarh. Tribune Photos: Manoj Mahajan and Vicky Gharu An injured woman with a child at the GMSH. Above and below: Victims admitted to the GMSH. The damaged autorickshaw near the market at Sector 22 in Chandigarh on Monday. (L) and The JCB machine that overturned near Sector 47 in Chandigarh on Monday. 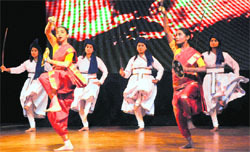 The Padam saluted the valour and bravery of Banda Singh Bahadur through a classic choreography titled “Bandi Bir” at the Tagore Theatre here today. Vice-Chancellor RC Sobti’s act of allegedly abruptly concluding the Syndicate meeting midway without even addressing 20 odd issues has left entire PU fraternity, including faculty, Syndics and Senators fuming. A total of 253 students of MBA, MCA, BBA and BCA received degrees at the 10th annual convocation of the Gian Jyoti Institute of Management and Technology, Phase II, here today. The function started with Saraswati Vandana, followed by the ceremonial lighting of lamp. Vandana Saxena has been appointed as the new principal of Tribune Model School, Sector 29, here. She has previously taught at senior positions in prominent educational institutions in Chandigarh and Delhi. Prior to her appointment at Tribune Model School, she was working as a senior teacher at Yadavindra Public School, Mohali. In what has left one and all surprised, Panjab University (PU) has so far registered only 80 odd unfair means cases (UMC) in its ongoing final examinations as compared to a whooping number of 300 last year. To create awareness among toddlers about colours, Red Day was celebrated at St Soldier’s School. The Punjab government has decided to reduce the octroi on petrol and diesel by one percent so that the common man, particularly the farming community, may be benefited. One person was killed in a road accident near Banur today. The deceased was identified as Gurmakh Singh, resident of Fauji colony, Banur. As per the information, the accident occurred when a car (Maruti Swift) rammed into the motorcyclist on Kharar- Banur road. The victim died on the spot. A married woman from Ambala allegedly committed suicide by hanging herself from a ceiling fan in her room today. The deceased was identified as Kamal alias Mona (27). However, her famil has alleged that their daughter was murdered. The cause of the death could not be ascertained so far. It is said that there was dispute between the husband and the wife over the selling of their house. Ramkesh Gorkha, a resident of Bichpari village, sat on a dharna in the middle of the old Delhi road close to the Ambala City Civil Hospital to protest against the misbehaviour of a doctor of the hospital this noon. His wife and his two children were also accompanying him on the dharna. Following allegations by a JE convicted in a graft case that the CBI had misplaced 191 documents pertaining to investment, the CBI court today directed the agency to probe the allegations and submit a detailed report in court in this regard. A head constable was suspended for being drunk on duty last night. Hardev Singh was found creating a ruckus in an inebriated state while on duty at Sector 34. The costly jewelry worn by an old NRI woman of Sector 11 had attracted the attention of a barber, who used to visit her house to shave her husband, luring him to plan a robbery at the old couple’s house. The crime branch of the UT police today arrested a notorious drug peddler. He was out on bail, but was again caught with a huge quantity of drugs. A 29-year-old accused attempted suicide in police lock-up at the Sector-39 police station in the wee hours today. Facing apathetic attitude of officials, players of Panjab University (PU) these days are running door-to-door carrying awarded scholarship cheques. Reason: The related bank (PU branch) is yet to receive the matching signatures of the present DSW (dean student welfare), Amrik Singh Ahluwalia. ccording to sources, signature of the DSW already exists with the bank but only valid for the poor student welfare scheme. And for these sports scholarships, the depository is yet to receive the counter signature of the official. Pugilists of PML SD Public School, Sector 32, won laurels in the 35th Junior Boy’s and 9th Junior Girls’ State Boxing Championship held at the boxing centre of the Sports Complex, Sector 42, here today. A boxing match in progress at the Sector 42 Sports Complex in Chandigarh on Monday. The cricket team of Laser Sharp Shooters, Sector 47, and Shivalik Smashers, Sector 41, won their respective matches of the ongoing Seven-a-Side Cricket Tournament being played to promote donation of body after death here today. Football teams of the Central Air Command (CAC) and Maintenance Command outclassed rivals during their respective matches of the ongoing Air Force Football Tournament being held at the 3BRD Station here today. In the first match of the Junior Inter-District Cricket Tournament, the local team defeated Yamunanagar at Government Model Senior Secondary School, Sector 19, here today. Table tennis players of St Xavier’s Senior Secondary School, Sector 44, brought laurels after winning the overall trophy of the ICSE Inter-School Table Tennis Tournament for the third consecutive year here. The players won this year’s edition at Tender Heart School earlier this month. In the ongoing CII KC Royal Park Corporate Cricket Cup being played at Guru Nanak Public School, Sector 36, the cricket team of Vodafone India Limited defeated Quark Xpress Publishing R&D India Private Limited here.